What a coincidence! 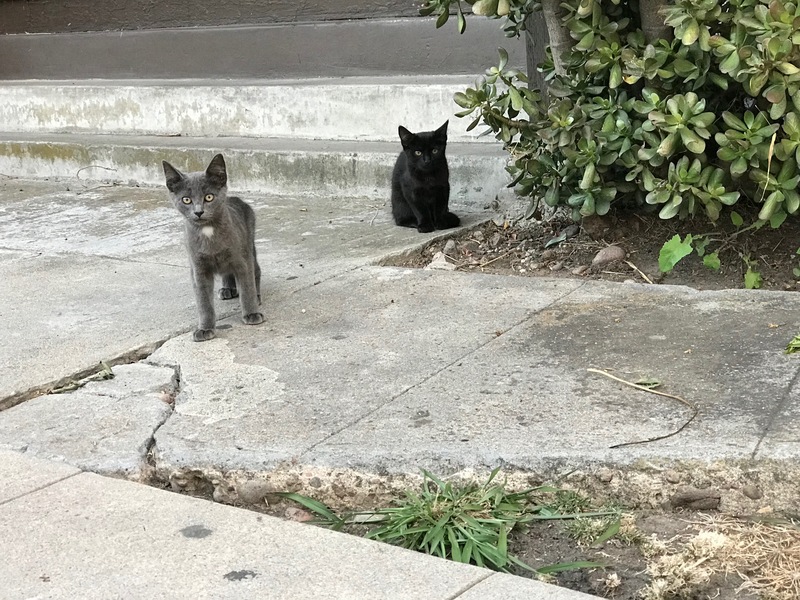 On the same block where yesterday I saw house stagers, three kittens, presumably feral, are loose; I encountered them about 10 hours later. They’re skittish, but scooted back rather than ran away. I might have made life-long friends had kibble been handy to give them. 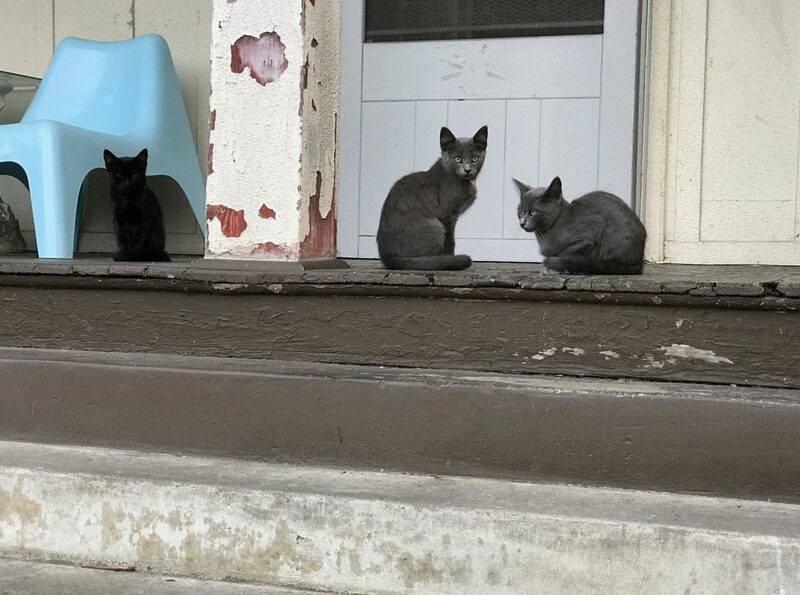 This series typically features neighborhood cats that, well, I expect to be long-term fixtures. The majority are obviously pets that are let outdoors. 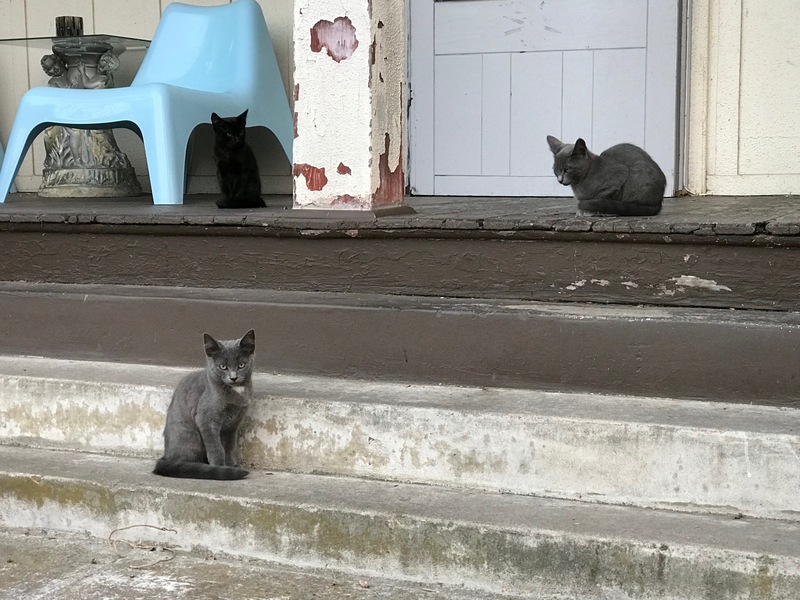 While the feral trio spent most of our visit hanging around a front porch, they clung more to the space as birthplace—perhaps below or in the bushes—rather than permanent home where they are owned. I expect that they will soon be captured and taken to the shelter; wouldn’t local adoption be so much better? I had gone out for a brief, brisk exercise walk, thinking my real camera—Leica Q—wouldn’t be needed. D-d-d-dumb thinking; iPhone 7 Plus had to suffice, for the 28 captures. The Featured Image is fourth shot, on the sidewalk. Look down to the Stop sign, and right there sets, hidden from view in this shot, the “coming soon” for sale house that I profiled yesterday. Vitals: f/2.8, ISO 64, 1/60 sec, 6.6mm; 7:10 p.m. PDT. 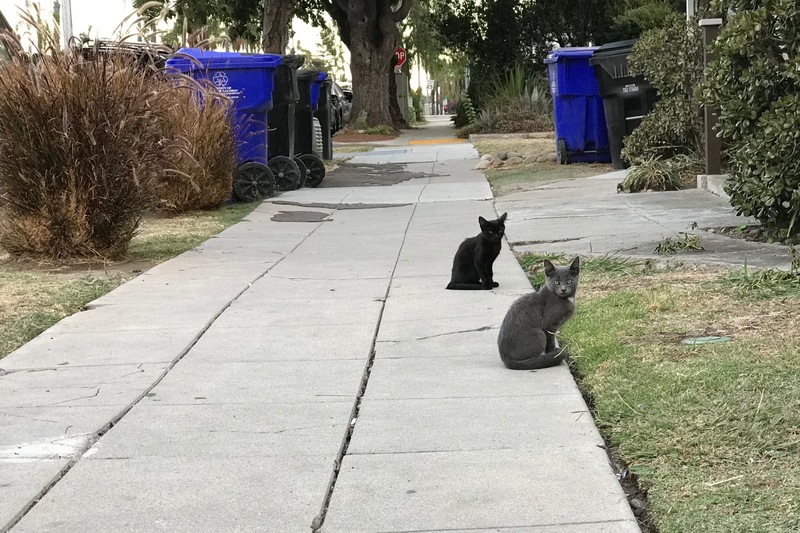 The second capture, during the same minute, could be called the “wild ones” for the beasties’ postures and the tense illusion that the leaning sidewalk creates. Vitals are same, but ISO 100. Pics three and four show how often, and how speedily, the animals moved whenever I adjusted my shooting position. Vitals are the same as the second portrait, at 7:11 p.m. PDT. The solo grey makes such a lovely portrait, I couldn’t resist. Vitals: f/2.8, ISO 125, 1/60 sec, 6.6mm; 7:14 p.m. PDT. This is the only one of the six-set presented here that wasn’t cropped. 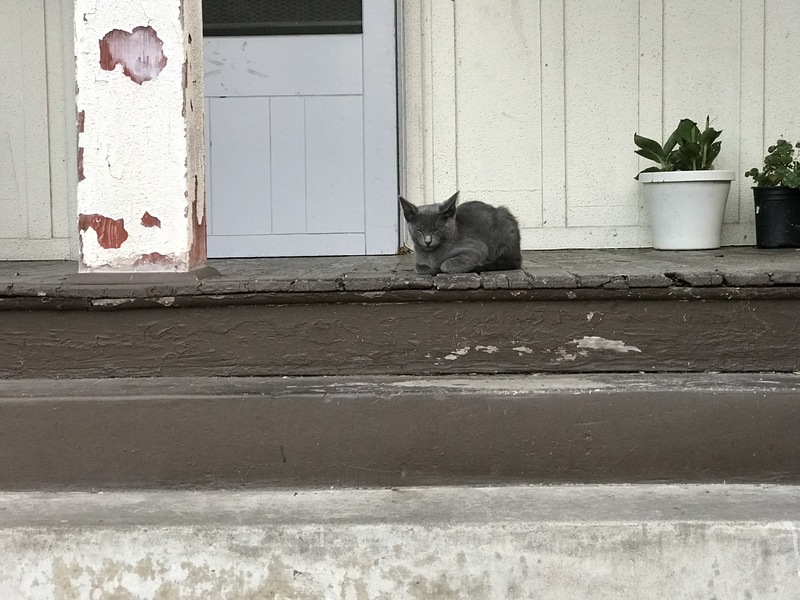 We wrap up with the greys sleepily—and sheepishly—commanding the porch. Vitals: f/2.8, ISO 160, 1/60 sec, 6.6mm; 7:16 p.m. PDT. Reminder: Click on any pic to see full-size image. 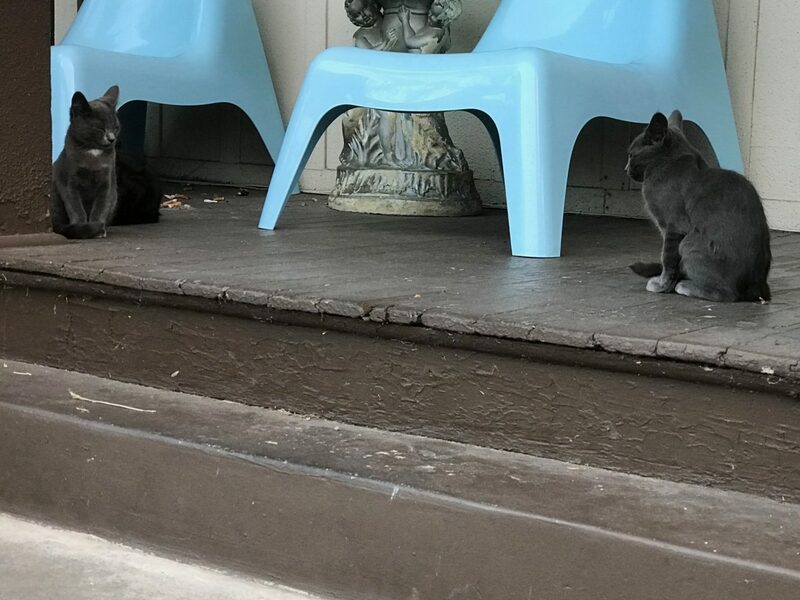 Previously featured felines: Scruffy, Roly Poly, Woo, Skull, Biscuit, The Colonel, White, Chipper, Frisky, Stretch, Needy, Farfisa, Mates, Hunter, Pee-Pee, Blue, Blue Too, Bonded Pair, Patience, Fess, Jumper, Frenemy, Looker, Cozy, Scout, Lurks, Skit, Mini, Betty, Black and White, Stalker, Bell, Chill, Sammy, Scratch, Poser, Star, Grey and White, Watcher, Herman, Comet, Roman, Willow, Chub, Nimbus, Watson, Lilo, Kit, Pepe, Twilight, Sebastian, Spot, Booger, Ash, Veruca, Riley, Mellow, Bonde, Flower, Glass, Black, BeBe, Fang, Bruce, Siamese, Pounce, Tortie, Haiku, Fraidy, Peso, Daniel Tiger, Dusk, Stride, Dainty, Spry, Tabby, Betty Too, Still, Levi, Shadow, Sophie, and Wink.